It’s not often that Mozart returns in the shape of a boy golfer from Holywood (pronounced Hollywood) in County Down. But that’s what happens when you win the world under-nine championship in the United States and then become a scratch golfer just weeks after your 13th birthday. At that time McIlroy was a regular topic of conversation in his native Ulster and something of a source of fascination, given his achievements and rapid progression. The following year he started to take flight. As Phil Mickelson was recording his first major win at the 2004 Masters, I interviewed the 14-year-old prodigy at Rosses Point in County Sligo where he was dispatching seasoned Irish internationals at the West of Ireland Championship with carefree abandon. He pronounced that he would turn pro after the Walker Cup three years later and was so clear in his visualization of where his life was headed, that you couldn’t but marvel at his self-belief. Over the intervening three years, he added two Irish Amateur Championships and a host of other big wins against top-class opposition. Under the watchful eyes of his hugely supportive parents Gerry and Rosie, he diligently honed his craft; allowing the world to take note as he blazed a trail in the British Open at Carnoustie, where he won the Silver Medal as the leading amateur. McIlroy duly signed on the dotted line as a tournament professional, as predicted, the day after the Walker Cup at Royal County Down in September 2007. He was off and running, making his debut at the Masters by 19 before recording two Tour wins in just 100 professional tournaments; at the Dubai Desert Classic and then claiming a breathtaking victory at Quail Hollow in Charlotte last May where he carded a course record 62 to beat the reigning Masters champion Phil Mickelson by four shots. Two months later, he recorded the lowest-ever first round score during the British Open at St. Andrews when shooting a nine-under-par round of 63. The ferocious winds the following afternoon taught him some harsh lessons as he returned an 80, but a solid weekend saw him finish in a tie for third behind stable-mate Louis Oosthuizen. Another podium finish came at the following month’s U.S. PGA Championship at Whistling Straits and now, a full eight months later, he stands atop the leaderboard alongside Spain’s Alvaro Quiros after a blistering 65 over the Augusta National course. Since those earliest days, McIlroy has always spoken of learning from his experiences and learning about himself. He has put his major championship education to very good use here, preparing diligently for this tilt at the Masters title. It was easy to observe his composure here on day one and Rory now knows only too well how far more he needs to go to secure that elusive Green Jacket. Who’s to say that he can’t now go on and become the second-youngest winner of the Masters after Tiger Woods. Only Rory has the answer. 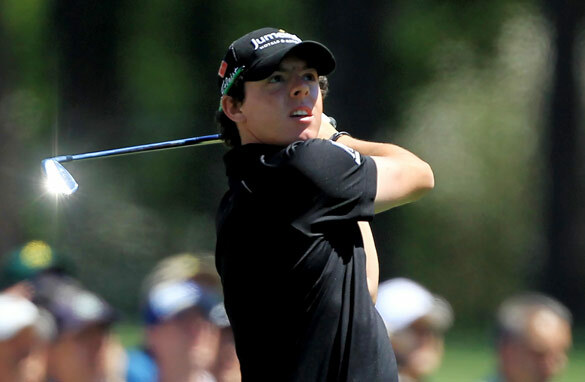 McIlroy has a great chance of winning the Masters if he continues to play how he is, but he needs to warm his putter up! Mozart of golf? Please, you must be the best at what you do to be compared to Mozart. You must begin as a gifted child prodigy. Like it or not Tiger Woods is the Mozart of Golf. At age 5 he shot a 48. He appeared on the Michael Douglas show and putted against Bob Hope at age 3. Child Prodigy? Tiger has won 71 PGA golf tournaments and 14 Majors. He has 128 World Wide Wins including 38 European Wins. He has 21 Amatuer Wins. I may be off a little but he won the World Junior Golf Championship 6 times and the first time at age 8 (9-10 year old division). He won the US Junior Amatuer Championship 3 times, he become the youngest champion ever when he won the US Amateur Championship. At age 13 he was paried wiht Professional Golfer John Daly and lost by a stroke. He also won an NCAA Title. I believe he has the highest winning percentage of any golfer who ever played the PGA Tour. He may have made mistakes in his personal life but Tiger Woods is the Mozart of Golf, not Rory McLroy. I would like to see Rory have success as I am Irish, but you are way off base here. If Rory is the Mozart of Golf?, where does Tiger Woods stands in your opinion? It's not just about golf, but also about the X factor that you bring to the game. Remember Woods playing in Australia in 2009? Australias stock exchange came to an halt. There is, there wasn't and there will be no greater golfer walking on this planet but Tiger Woods. Whether he will or not break the 18 majors records of Jack Niclaus. Caught your interview on 2fm yesterday and as a consequence watched Living golf for the first time – re US open. Great show – different style – which I really liked. especially liked the visit to GMac and the piece with Ricky Fowler. Best of luck with the programme. If you ever want to play Tramore( recent upgrade is fantastic) give me a call.